It has been a tough decision, mainly because the iPad Pro is big. At the end I loved how the keyboard is integrated (no bluetooth, no cable) and the quality of the screen. Except when I need strong statistical tools, 95% of my work is done with the iPad, so I needed to feel comfortable. 1. It might take an eternity to finish restoring the copy, even more than a week. However everything seems to be in place and the iPad becomes fully functional after some hours. Why is that? I don't know, but you can read it in many forums. It is not possible to update the IOS until the restoring process has been completed. Some users get impatient and stop the restore through Settings. Probably you lose something, but not clear what. 2. Apps that no longer appear in the Apple Store you cannot restore. I know it is clearly unfair because you have paid for then and you don't mind using the old one. Some say that you can restore them using iTunes. I tried and failed. It seems impossible now. One app that I'm seriously going to miss is Blogsy. 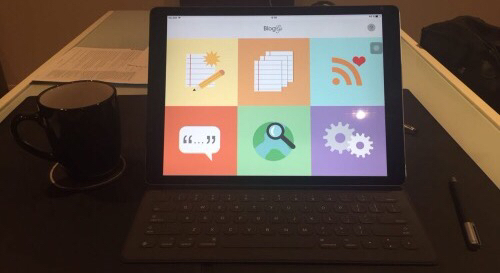 I used it to write in many blogs (Wordpress, Blogger, Tumblr...), all with the same application. Now I have to use the Wordpress app for the articles in Wordpress-based blogs. Also Google has done a terrible job with Blogger. First, there is no app for Blogger believe it or not (no Blogger app anymore), second, Chrome extension on the iPad is not complete and have many bugs..So no good solution. Right now I use a pretty basic app called BlogGo, that at least works.